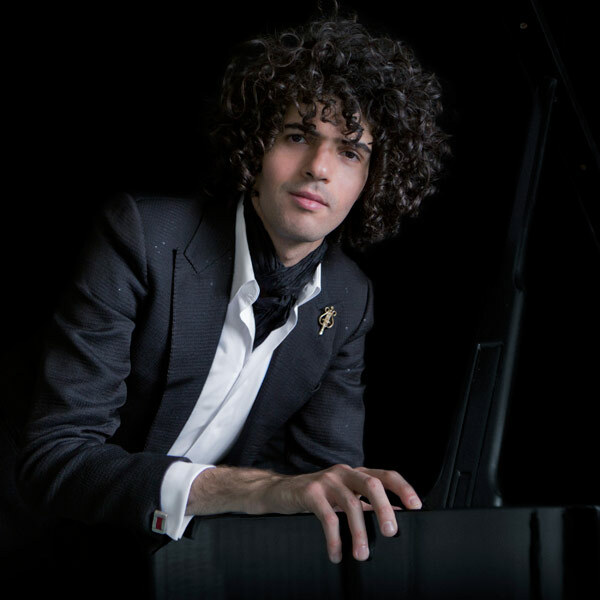 Simon Ghraichy, who has been qualified as a “world-class musician” by NBC News and “the classical piano-rockstar” by Quién Mag, is a 30 year old Lebanese-Mexican pianist who has lived and studied in Europe. After being the student of Hortense Cartier-Bresson in the Boulogne Conservatory, he was admitted to the Conservatoire National Supérieur de Musique de Paris (CNSMDP) in 2006 to study with prof. Michel Beroff and Daria Hovora. Moreover, after attending a masterclass with Tuija Hakkila, he decided to follow her and study simultaneously in the Sibelius Academy of Helsinki in Finland. In 2010, he graduated from the Paris Conservatory and received a Masters degree with “honorific mention.” Ghraichy has been performing recitals, chamber music concerts and as a soloist with orchestra for many years now. His career took a jumpstart in 2010 with the publication of Robert Hughes’ critic, cultural journalist at the Wall Street Journal, who has particularly appreciated Simon Ghraichy’s interpretation of the Réminiscences de Don Juan of Franz Liszt. He has performed recitals all over the world. Therefore, one could have heard him in France in the Musée d’Orsay, in the Salle Cortot and Salle Marshall in Paris and in different summer festivals. In Europe, he has performed in the Vredenburg Hall and Eindhoven Muziekgebouw (The Netherlands), the Crossing Keyboards Festival (Estonia, Latvia, Lithuania), the Temppeliaukiokirkko (Finland) and the EXIT Festival (Serbia). Internationally, he performs too in Mexico (Sala Felipe Villanueva in Toluca, Centro Cultural Mexiquense Bicentenario in Mexico City, Teatro Degollado in Guadalajara, Auditorium San Pedro in Monterrey), in Brazil (Sala Cecilia Meireles in Rio de Janero), in Australia (Steinway Foundation and the Roseville Music Club in Sydney, the Burnie Arts Center), in Lebanon (Saint-Joseph Church and the Assembly Hall) and in South Africa (UniSA Festival in Pretoria). Thus, he has performed over the five continents. As a soloist, Simon Ghraichy is regularly invited to perform with various orchestras: State of Mexico Symphony Orchestra, Cuban National Symphonic Orchestra, Orquesta Sinfonica do Brasil, Cairo Symphony Orchestra, Lebanese Philharmonic Orchestra, State of Almaty Symphony Orchestra, Guadalajara Juvenile Symphony Orchestra, Jalisco Philharmonic Orchestra, Sessession Orchestra. In 2015, he made his Debut in the International Lyrical Festival of Aix-en-Provence in France, the Baalbeck International Music Festival in Lebanon and the Bard Music Festival in New York next to the American Symphony Orchestra. His recital program “Liszt & the Americas” featuring Liszt’s works and composers from the USA and Latin America was spotted by the American organization and producer New York Concert Artists. They invited Simon Ghraichy to perform a solo recital in Carnegie Hall in New York City, Kennedy Center in Washington DC and in the Berlin Philharmony. He will be performing again in Carnegie hall for the second year consecutively in October 2016. Simon Ghraichy’s second CD “Duels”, featuring Liszt’s b minor sonata, Schumann’s Kreisleriana and Liszt’s transcription of Beethoven’s Allegretto from 7th Symphony is released with the Dutch Label Challenge Records International. He is also supported by Sponsors (AXA insurances, Caisses d’Épargne) and foundations (Luc Walter Foundation).